B"H here in Monsey there is amazing hafatza in motion. 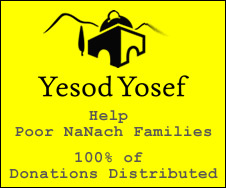 The last time I was here and I visited the "normal" Breslov shteibel they wanted to kick me out, so this time I almost didn't go, but as Divine Providence had it I ended up visiting and I was very pleasantly surprised to see that there are new young people there that have started a serious hafatza drive. There is a book case full of books, many of them Nanach publications, and these guys also bought a small schoolbus or van which they just painted white (because as long as it's yellow it requires a special license) and they are going to different places and setting up tables with the books. They put stickers with their phone number, and people are calling them all the time. So B"H I was able to hook them up with even better Nanach connections, and B"H they'll be even more amazing hafatza. Those guys are in addition to our amazing Nanach friends, who are doing real Nanach hafatza in Monsey - and get the credit for decorating my new DR. Gevald Nanach mobile. The other day, for the first time I think, I entered BME and I met the Rosh Yeshiva, Y.F. and I told him that Rabbainu said that if one wants to be a "lamdan" he should learn Likutay Moharan, and we chatted a bit, and I gave him a copy of my Likutay Nanach. Y.F. didn't want me to enter the study hall so as not to disturb, so he had one of the men pay me off from the pushka (charity box) $10! Then I met one of the members, and it was clear that he had started studying Likutay Moharan and had books of Rabbainu. B"H Sharon sent me personalized Peteks, with my phone number and email, to help me connect with people here. Tonight B"H there's the Wednesday night chill, which I hope to Nanach. That's some of the excitement here, BH.